NZ birds galore in this new counting book! 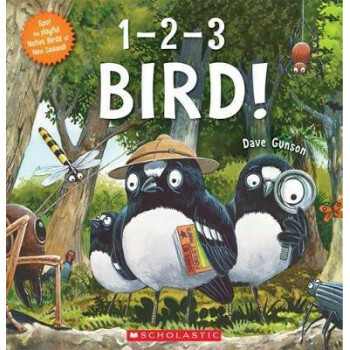 Young children will love spotting familiar birds in this fun text from Dave Gunson. From `One noisy seagull, asking to be fed' to `Thirteen sleepy moreporks, slowly waking in the trees', the birds are just asking to be counted. There is also a sneaky numeral hidden on each page spread, and a number of other creatures shown in the back that are there to be found too. - From Dave Gunson, experienced author/illustrator of Wildlife Stuff and Mr Muggs the Library Cat, among many others - Hilarious illustrations that will delight children - Includes all sorts of extra details that are fun to find.